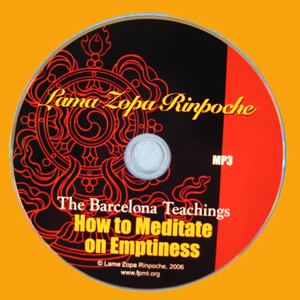 In September 2005, Lama Zopa Rinpoche gave extraordinary teachings on emptiness and how to meditate on emptiness. This MP3 includes preliminary teachings on happiness, what is mind and how to most effectively use the mind, and then proceeds to detailed commentary on emptiness. Rinpoche defines the “I,” addresses issues of the false “I” and our fear of losing the “I.” Emptiness is explained relating to external objects and when practicing Guru Yoga. Detailed explanation is given for how to meditate on the emptiness of the “I,” the emptiness of others, and the emptiness of time. This extraordinary series of teachings concludes with teachings on refuge, and an explanation and oral transmission of several sutras, including four chapters of Sutra of Golden Light. Rinpoche teaches with his usual mixture of profound insight, compassion, clarity, and humor. “When all the causes and conditions come together, when you receive the blessings of the Guru, when you collect the necessary merit and purify the negative karma of the obstacles, then suddenly your meditation works. Your meditation on emptiness hits right on the object apprehended by the concept of true existence.” – Lama Zopa Rinpoche. For a written transcript of teachings please click here and here for the hardcopy version. Download instructions to download MP3s . Note: This is a large file, it may take 10 min. to download. and low quality recording.